This pack includes 4 individual metal dies that cut up to 1.4mm deep for your mixed media craft projects. This versatile new collection of mixed media and regular metal dies from talented designer Sheena Douglass will allow crafters to create their own beautiful 3D-effect layered flowers with ease. The mixed media die packs contains three different petal sizes, which can be die-cut individually on materials up to 1.4mm thick and built up to your desired finish, for perfectly co-ordinated blooms every time. Layer, assemble and curl the petals to enjoy the beauty of a blossom. Wonderful addition to cards, scrapbook pages and mixed media projects. Designed by Scrappy Cat. Spellbinders Shapeabilities Die D-Lites cut, emboss and stencil with a single die template. Approximate Sizes: Circle: 3/8", Disc Floret: 1/2", Petal 1: 1/2 x 3/4", Petal 2: 5/8 x 1", Petal 3: 3/4 x 2 1/4", Petal 4: 3/4 x 2 1/4" (Solid). 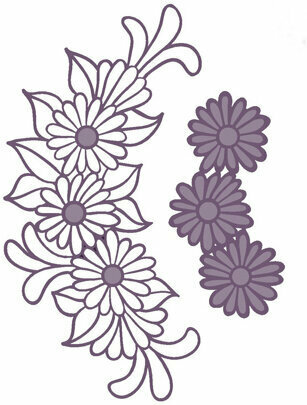 Die D-Lites Sketched Blooms Etched Dies includes three different adorable blooms. 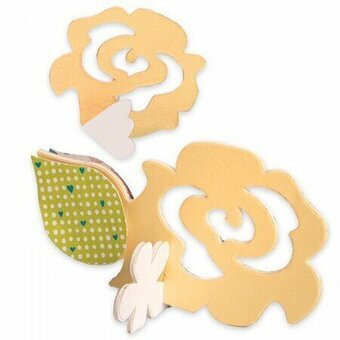 In addition, we offer S3-323 Sketched Blooms 2 set. Spellbinders Die D-Lites cut, emboss and stencil with a single die template. Approximate Size: Sun Flower : 1.70 x 2.66 in. 4.40 x 6.80 cm, Daisy: 1.49 x 2.29 in. 3.80 x 5.80 cm, Tulip: 1.23 x 2.58 in. 3.20 x 6.60 cm. Shapeabilities Petite Double Bow and Flowers Etched Dies Elegant 3D Vignettes Collection by Becca Feeken is a set of three dies includes pieces to create the perfect double bow, complete with bow tails and flower accents. Die-cut two each of the double bow die and bow tail die. Match up the tabs of the double bow die cut and loop each bow piece to the bottom hole, secure with a brad. Then loop over the protruding tab over to cover to make a center loop, add bow tails and secure all with the same brad. Decorate with the flower accent or leave as it. Approximate Size: Double Bow: 2.30 x 3.05 in. 5.80 x 7.70 cm, Bow Tail: 0.80 x 1.85 in. 2.00 x 4.70 cm, Large Flower: 0.70 x 0.70 in. 1.80 x 1.80 cm, Small Flower: 0.55 x 0.55 in. 1.40 x 1.40 cm. Shapeabilities Tulip Flower Box Etched Dies Exquisite Splendor by Marisa Job is a set of 10 dies to create a fun and sweet tulip-themed box with the design elements included. Add a handle and it becomes a basket! Assembled size: 2.125 x 2.25 inches for small flower box and 4.25 x 2.25 Inches for large flower box. Shapeabilities Floral Gatefold Etched Dies Flower Garden by Sharyn Sowell is a beautiful intricate die full of floral and leaf motifs. What grows in your garden? Bring wonderful botanical elements into your projects with the Flower Garden Collection by Sharyn Sowell. Spellbinders Shapeabilities cut, deboss, emboss and stencil with a single etched die template. Approximate Size: 4.15 x 7.10 in. 10.50 x 18.00 cm. Shapeabilities Rose Bird Topiary Etched Dies Flower Garden by Sharyn Sowell is a set of three dies includes an intricate cut floral frame with a tag die to fit in the frame and the word LOVE to add or stamp your favorite word or phrase. What grows in your garden? Bring wonderful botanical elements into your projects with the Flower Garden Collection by Sharyn Sowell. Spellbinders Shapeabilities cut, deboss, emboss and stencil with a single etched die template. Approximate Size: Love: 1.50 x 0.65 in. 3.80 x 1.60 cm, Tag: 3.05 x 2.00 in. 7.70 x 2.80 cm, Floral Frame: 4.00 x 4.95 in. 10.10 x 12.50 cm. Shapeabilities Rosemal Flowers Etched Dies Folk Art Collection by Lene Lok includes one intricate scrollwork design for a beautiful focal piece or die-cut many for a background design. Folk Art Collection by Lene Lok is inspired by Norwegian folk art with its flower designs featuring scrollwork and flowing lines to create flowing patterns. Bring these whimsical elements into your next projects. Approximate Size: Floral: 2.40 x 5.00 in. 6.10 x 12.70 cm. Shapeabilities Tiered Rosettes Etched Dies Elegant 3D Vignettes Collection by Becca Feeken is a set of six dies includes a base with three different petal edged toppers and two flower centers. Gives you several flower options to add to your project. Elegant 3D Vignettes Collection by Becca Feeken brings her romantic elegance style to the next level in a three dimensional format. Most of this collection purposively makes a dimensional creation or offers elements to enhance a dimensional piece for a mix or match option. Approximate Size: Rosette Base: 6.60 x 1.35 in. 16.80 x 3.40 cm, Deco Points Topper: 6.60 x 0.40 in. 16.80 x 1.00 cm, Scallop Topper: 6.60 x 0.25 in. 16.80 x 0.64 cm, Zig Zag Topper: 6.60 x 0.25 in. 16.80 x 0.64 cm, Rosette Centers (2): 0.88 x 0.88 in. 2.20 x 2.20 cm. The daisy measures 2-1/2" x 2-3/4". These dies are compatible with most tabletop die cut machines. Additional shims may be necessary and some machines handle the detail level better than others. Craft die featuring a square label with flowers. Sue Wilson-Finishing Touches Collection-Cape Daisy. Designed by Sue Wilson these cutting dies are an elegant collection of high quality steel designed to co-ordinate with each other. 5 dies. Sizes: Smallest: 0.40" x 0.40, Largest: 1.75" x 1.75". Sue Wilson Die Daisy Cluster. 2 dies featuring flowers. Size: 1.97"w x 4.13"h. Creative Expressions Craft Dies can be used in most leading die cutting machines including The Press Boss, Grand Calibur by Spellbinders, Cuttlebug by Provocraft, Big Shot by Sizzix and eBosser by Craftwell. Sue Wilson - Finishing Touches - Striped Nasturtiums. Designed by Sue Wilson these cutting dies are an elegant collection of high quality steel designed to co-ordinate with each other. 6 dies. Sizes: Smallest: 1.0" x 1.0", Largest: 1.55" x 1.50". Sue Wilson Die - Orange Blossom - Complete Petals. 16 dies featuring flowers. Largest petal: 2.36" x 2.36". Smallest petal: 0.59" x 0.59". Creative Expressions Craft Dies can be used in most leading die cutting machines including The Press Boss, Grand Calibur by Spellbinders, Cuttlebug by Provocraft, Big Shot by Sizzix and eBosser by Craftwell. This set of floral dies will give you everything you need to make a variety of flowers in different sizes. Mix and match pieces for different results each time. Craft Dies by Sue Wilson are part of an elegant collection of high quality steel dies designed to coordinate with each other. Coordinates with UMS823. Includes 23 dies. Largest 2.15" x 2.15", Smallest 0.25" x 0.25". 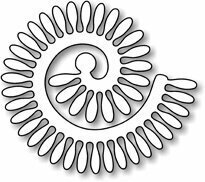 Add a lovely floral touch to your projects with these spiral flowers. Includes 9 dies. Size Largest: 1.97 x 1.97 inches, Smallest: 0.24 x 0.24 inches. Finishing Touches Collection Starlight Daisy Die. An elegant collection of high quality steel dies designed to coordinate with each other. This set includes 12 dies that can be used together to design a bouquet of modern-style daisies. Size: Largest: 1.46 x 2.64 inches. Smallest: 1.22 x 0.47 inches. 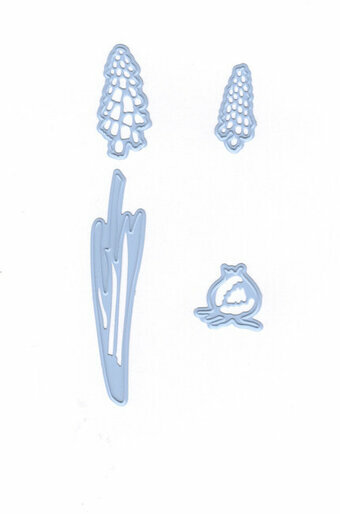 A cutting die set that coordinates perfectly with our Sunny Vase Cling Rubber Stamp Set. Cut out tons of sunflowers for pop-up cards, home decor and more. These high quality, stainless steel, wafer thin, cutting dies are intended for use with most major die cutting machines. Tattered Lace Dies - Floral Layers Leaves 1. Detailed and Delicate, Tattered Lace Dies are the most intricate dies available. This Essentials by Tattered Lace die is a must have for all your projects, giving you the perfect size shape any time. These dies measure approximately: Small Leaf: 0.55in x 0.83in, Medium Leaf: 0.79in x 1.18in, Large Leaf: 2.79in x 1.5in. Tattered Lace Die - Spinning Charm Flower. Detailed and delicate, Tattered Lace Dies are the most intricate dies available. This topper die gives you the perfect finishing touch to all of your projects. This die measures approx 3 1/16" x 2 3/8". Thinlits create dazzling detailed shapes for more creative cardmaking and papercrafting projects. These wafer-thin chemically-etched die sets are designed to cut, emboss or stencil a single sheet of cardstock, paper, metallic foil or vellum. They are simple to use, compact and portable for cutting at home or on the go. Use them for enhanced intricacy and to add a special touch of inspiration to all your projects. Design Dimensions 2 1/2" x 4 7/8" - 1 7/8" x 3". Creatables are handy stencils that cut and/or emboss. They can be used in many machines, with all kinds of paper. 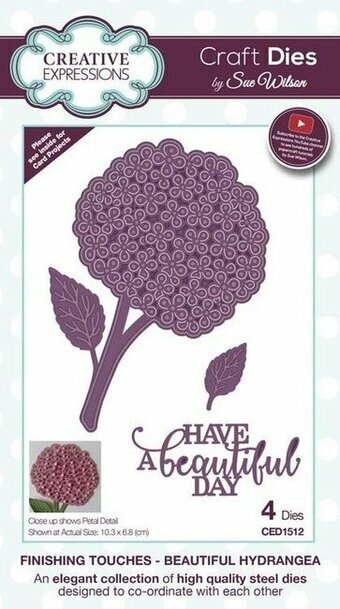 The cut-out and embossed shapes are ideal to make your cards and other creative projects even more beautiful. Craft die from Altenew featuring tropical flowers and the word "Aloha". There are a total of 7 dies in this set.